In the past few years, we've had many discussions about the proliferation of biopics and real-life dramas, especially during awards season. And while these films are abundant and many are entertaining, how many of them carry a message? They may shine a spotlight on the important events of that time period, but do they relate this to the present? As writer and philosopher George Santayana famously said, "Those who cannot remember the past are condemned to repeat it." Thus, it's quite intriguing when movies like BlacKkKlansman can draw a straight line from the past to the present. It's the early 1970s and Ron Stallworth (John David Washington) has decided to join the Colorado Springs Police Department, as they are actively recruiting minorities. But, he's not thrilled when he assigned to the records room. This changes when he's asked to go undercover at a Black Panther rally to gauge the possibility of violence. There, he meets a young activist named Patrice (Laura Harrier), but doesn't reveal that he's with the police. Following this job, Stallworth is promoted to detective. One day, he sees an ad in the newspaper for the Ku Klux Klan, and, on a whim, calls to get information...and uses his real name. Sensing that the Klan is a dangerous outfit Stallworth convinces his commander (Robert John Burke) that an investigation is warranted. But, as a black man can't show up in person, fellow detective Flip Zimmerman (Adam Driver) is tapped to be the white version of Ron Stallworth. And so begins an odd operation where Flip goes to Klan meetings, while Ron gathers information over the phone. They soon realize that their plan is going to come to a head when national Klan leader David Duke (Topher Grace) comes to town. Over the years, Spike Lee has made an array of movies, and he's tackled biopics and movies based on real-life events in projects like Malcolm X and Summer of Sam. He's also made crime-thrillers with the likes of Clockers and Inside Man. With BlacKkKlansman, he calls upon those experiences to make a movie which works on several levels. On the one hand, it's a tightly-crafted police thriller. Starting with Stallworth's seemingly innocuous phone call, the story continues to build and build. Following a meeting with a group of odd men, Stallworth and Zimmerman begin to realize that the racist rhetoric is just the tip of the iceberg, as this group has some dangerous plans. Zimmerman's infiltration into the Klan reveals that their families are involved and that their beliefs aren't simple posturing. An investigation into a fringe group develops into a race to stop a terrorist act. On the other hand, BlacKkKlansman is an overarching study of race relations and racism. From the moment that Stallworth enters the police station, he feels like an outsider and must fight to prove himself. However, when he goes undercover and meets Patrice, it's all that he can do to protect his identity, as the meeting feels very inviting. Following this, Stallworth must learn to work with and trust Zimmerman and fellow detective Jimmy (Michael Buscemi), as they are putting their lives in one another's hands. Then, the movie presents an unblinking view of the Ku Klux Klan and their extremely racist views. Lee doesn't pull any punches here, and many will be disturbed by the language used, and rightly so. But, it's here that Lee and fellow screenwriters Charlie Wachtel, David Rabinowitz, and Kevin Willmott begin to weave in some very clever language which illustrates that the views of David Duke and the Klan aren't very different from some of the things which we hear leaders say on television today. BlacKkKlansman concludes with footage from the 2017 riot in Charlottesville, VA. I can see how some would say that Lee went too far here and that it's heavy-handed, but it's also very emotional, and it really drives home Lee's message that the more things change, the more that they stay the same. 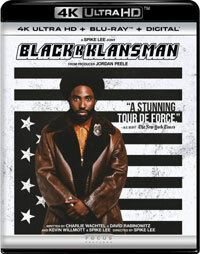 I can see how the film's odd title and Lee's name may make some viewers wary, but BlacKkKlansman is certainly worth checking out. The movie is a rare combination of a suspenseful thriller which contains touches of humor and a very important message. BlacKkKlansman did make me think of Undercover Brother at times on 4K UHD courtesy of Universal Studios Home Entertainment. The film has been letterboxed at 2.35:1 and the Disc contains an HEVC 2160p transfer which runs at an average of 70 Mbps. The movie was shot in film, a fact which is immediately apparent (isn't that weird? ), and we get some very mild grain here, but no defects from the source materials. The colors look good and the image is never overly dark or bright. The level of detail is impressive, as we can make out textures on objects, and the depth works quite well. The Disc carries a Dolby Atmos audio track which runs at 48 kHz and an average of 4.0 Mbps. The track provides clear dialogue and sound effects. The track shows off a surprisingly impressive use of surround sound, most notably during the Black Panther meeting, as the rear speaker is filled with individual sounds from the crowd. The creativity of the mix really places us in the moment. The finale shows off some impressive subwoofer effects. The BlacKkKlansman 4K UHD contains only two extra features. "A Spike Lee Joint" (5 minutes) offers comments from Producer Jordan Peele, John David Washington, Topher Grace, Laura Harrier, Harry Belafonte and the real Ron Stallworth, who talk about the story and Lee's approach to it. The only other extra is an extended trailer for the film featuring "Mary Don't You Weep" by Prince. I had hoped that the extras would have contained more details about the real-life story.